Collage is one of the few artistic practices that navigate freely between what we have termed high and low art or, more radically, between art and craft. Collage feeds off the plethora of images contemporary society produces, appropriates its detritus, absorbs anything and everything into its visual field. It deals with ephemera, offering new meaning through recontextualization. Like hip hop, sampling and mash-up, collage utilizes a juxtaposition of existing fragments from disparate unknown sources and, perhaps more than any other artistic medium, reflects a desire to harvest the chaos of the everyday without neutralizing its potential. Tending to flourish in times of conflict and social change, collage provides artists with a way to engage with the issues of the day in a direct, easily readable form. It is a medium that embraces contradiction and multiplicity, is infused with political, often activist motivations, and so may be considered an ethical gesture. The present exhibition brings together the work of eight artists who employ techniques of collage (as well as decoupage and montage) to very different ends and evoke distinct historical traditions. Montréal painter David Elliott’s large-scale canvas Chutes, 2007, takes the form of a theatrical space into which bits and pieces of found popular imagery are depicted in disjunctive scales so as to produce a Surrealist image. 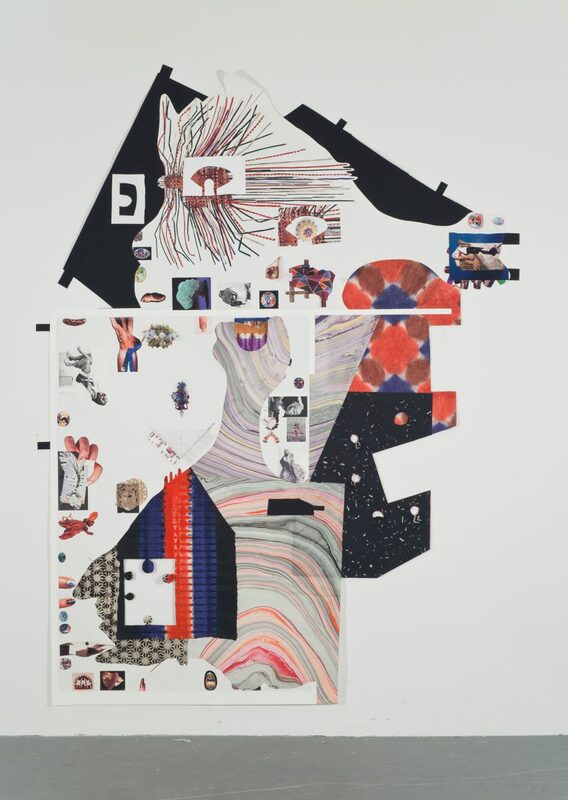 Luanne Martineau’s large paper work The Lack of It the Dream, 2013, is a whirlwind of patterns combined with recognizable imagery (crystals and gems, fake fingernails and fragmented body forms, statuary and headdresses), creating a highly complex visual field. 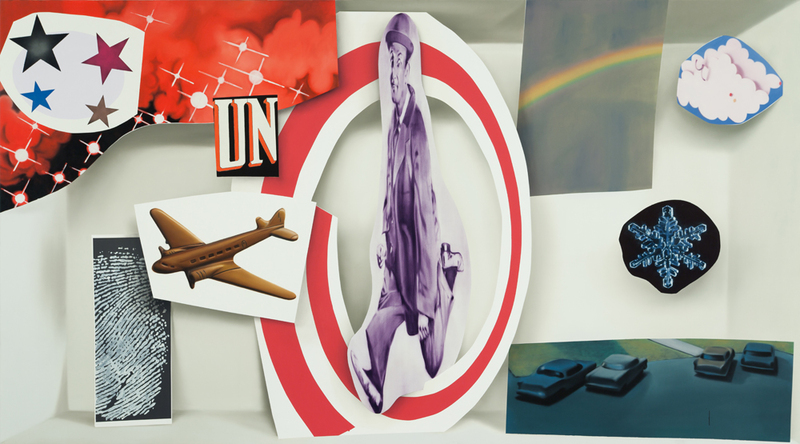 Known primarily as a painter, Louis-Philippe Côté has been making collages since he was a teenager, and the thirty paper works entitled Data, 1996-2013, clearly draw on the tradition of photomontage by Dadaist artists such as Georg Groz and Hannah Hoch. The at times shocking confrontation of imagery from newspapers and magazines explicitly reflects the bombardment of images we are subjected to every day, particularly the prevalence of representations of the female body. Strictly speaking, Hajra Waheed and Paul Butler’s very different works are decoupages rather than collages. Waheed’s A Short Film from Sea Change: Character 1: In the Rough, 2013, is a highly evocative and cinematographic narrative of one man’s journey of discovery, in the form of a collage of 300 negative glass slides and postcards from the 1930s and 1940s. The decidedly more abstract collages by Paul Butler, in which all the textual information in Artforum ads has been deleted, may be read as commentary on the wealth of meta-textual information contained in the extensive pages given over to commercial interests in art magazines. 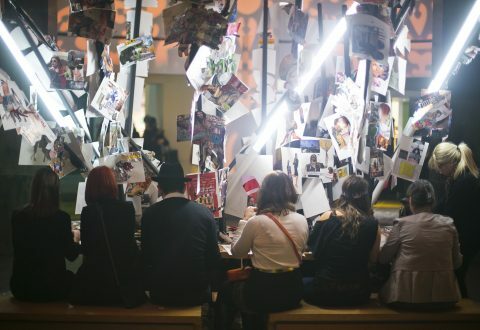 His The Collage Party Pavilion (v2), 2011, installed in La Rotonde, provides visitors with a forum to create their own collages. Thomas Corriveau’s 16-mm film Kidnappé, 1984-1988, constitutes a rather succinct summary of the multiple ways collage techniques may be used, including, as it does, stop-motion animations of perspectival anamorphoses made from cutouts from magazines, as well as montages of staged photographs. And finally, Trevor Mahovsky and Rhonda Weppler’s sculpture Prop, 2007, demonstrates the elastic nature of what may be termed a collage. Louis-Philippe Côté, Data, 1996-2013 Collage on paper, 33 × 25.5 cm.